The hardest part about writing a review for a collection this diverse is coming up with a singular opinion to describe the entire ensemble of stories. 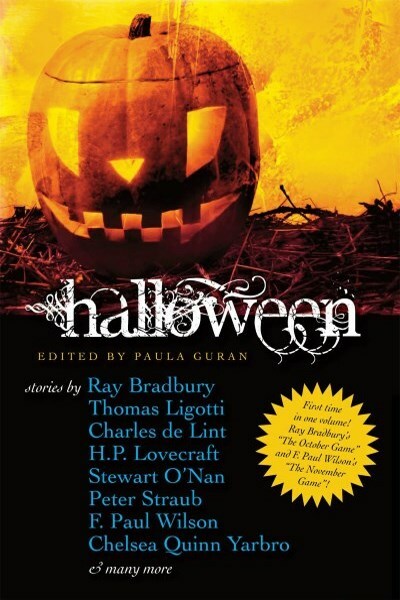 Halloween, edited by Paula Guran, is a rich collection of seasonal stories by the likes of Charles de Lint, H.P. Lovecraft, Peter Straub, Glen Hirshberg, and many more. It contains poems, short stories, and a few works which either reach novelette status or come really close. The shortest story is a few pages. The longest, well over fifty. The only story missing from the Kindle version of the book is Ray Bradbury’s “The October Game” because Bradbury’s estate does not allow digital versions of his works (If that is a particular concern, I recommend purchasing the print version, which does contain Bradbury’s contribution). Guran does include a summary of the missing entry, though, which is especially useful since the very next story, “The November Game” by F. Paul Wilson, ties directly into that one. “Halloween” stands in at 480 pages. It contains everything from the macabre to the hilarious to the downright depressing. The horror of some stories is driven by supernatural forces; others by the pure evil nature of seemingly ordinary people. Across all of the stories there is a wide array of characters, from the deranged to the just, from the old to the young, from the human to the inhuman. Needless to say, there is something for every Halloween fiction enthusiast here. Guran begins her collection with a fairly long preface discussing the origins and evolution of Halloween, which likely sprung from the Celtic festival of Samhain. Little is know of the practices and rituals associated with Samhain since the Celts did not write anything down, but it is believed that in their culture faerie-folk were resentful of humans, who slowly were taking over the world. During Samhain, the faerie-folk’s power was enhanced, and thus so was their propensity for mischief. Samhain was eventually adopted by the Christians, who made it into a celebration of the Virgin Mary and martyred saints. October 31 became All Hallows’ Eve (‘hallow’ was synonymous with ‘saint’ during the Middle Ages), though the old ways did not die out so easily. Today, Guran proposes, the holiday is really split in half between adults and children. For grown-ups, Halloween is the third biggest “party day” of the year (New Years and Super Bowl Sunday are first and second, respectively). While the modern celebration of the holiday has mostly been confined to North America, retailers are slowly pushing it into other markets as well, including Japan. As far as the stories contained in “Halloween,” I found many enjoyable. There’s “The Halloween Man,” which tells the story of a demon that rises once a year to hunt for children’s souls. “Pork Pie Hat,” which I’m still scratching my head over (but in a good way). “Three Doors,” a moving tale also included in Norman Partridge’s Johnny Halloween. “Auntie Elspeth’s Halloween Story, or the Gourd, the Bad, and the Ugly,” a hilarious story within a story told when three grandchildren are unceremoniously dropped off to visit their aunt. The list goes on from there. All told, there are over thirty stories and poems to read. “Halloween” would have earned a solid four rockets if not for the numerous typos I discovered while reading. Many readers demand perfect spelling and grammar; I am one of them. Some of the errors were simple characters missing. Others were entire words or a repeated word. These sorts of errors jar the reader from the experience and are somewhat easily corrected by employing a good line editor and proofreaders. That aside, Halloween is such a diverse blend of Halloween stories there’s really something for everyone here. I give it three rockets and a solid recommendation to add it to your Halloween reading list.